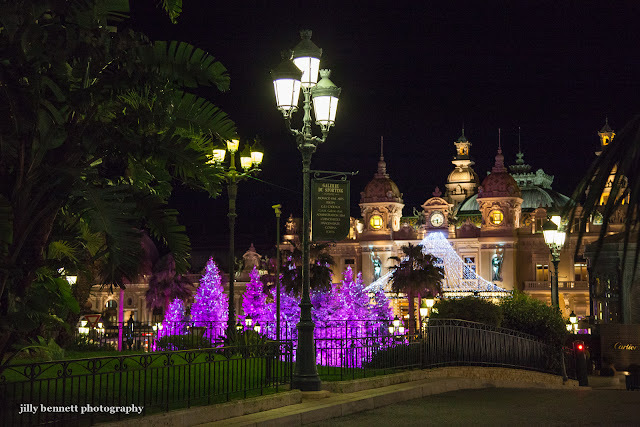 The photo was taken from the entrance to the Winter Sporting, showing not only the casino and the Christmass trees, but also some of Monte Carlo's beautiful street lamps. The Christmas decorations, which will remain in place until 6 January 2013, are comprised of 80 Christmas trees, up to 9 metres high and sprinkled with snow; 13 metallic, garlanded Christmas trees, the tallest of which is 10 metres high; 2,500 Christmas baubles; 600 starflash lights; 400 LED garlands; 150 m of gold garlands; 100 strings of silver balls; 700 m2 of white wadding and 46 spotlights. Faithful to its "Be Green" environmentally friendly label and its social commitment, the Groupe Monte-Carlo SBM has ensured that all these decorations are as environmentally responsible as possible. The Christmas trees are from sustainable, regulated farming and the LED lighting system is energy saving. The Christmas baubles are from the Ary-France Centre, which employs people with disabilities.